Each week I Homeschool my littles and by Friday afternoon I am sitting quietly in our living room, laundry folded, house clean, candle lit and enjoying some time to myself. Sound crazy? Well this is a beautiful picture of what it looks like when you follow a cleaning routine that works for you not against you. What I am about to tell you is not that I have magical fairies, or that I hire a house cleaner or that I have a family member help out. It involves hard work but if you’re like me, this cleaning concept just might free you from the feeling of never keeping up on the cleaning. When I first became a young Mom I was blessed to live in a neighborhood with community, we actually went outside and really got to know our neighbors. A group of us Moms were working and stay at home Mothers and had young children, we were beginning to navigate the unknown waters of accomplishing things in our home without drowning in stress and exhaustion. Over the course of many wonderful days sitting outside while our children played together we all gleaned a wealth of information Mom to Mom on how to make things work in our homes. You see, I am not a person who can function in a messy house. I’m just not cut out of that cloth, when things are messy I am a mess. Here I was with a lot of tiny kiddos who couldn’t help me at all and it was so defeating. I was struggling and felt like I was working on cleaning all the time, yet nothing ever felt clean. That’s what happens when you have small ones following behind your routine with dirty footprints and baskets of toys! That’s when a few of these wonderful Mom friends of mine introduced me to this wonderful concept. So here is how it works, every Friday morning we all wake up and clean the entire house top to bottom. Sounds like a lot of work and I won’t tell you it isn’t, but this has actually been quite freeing for me in many ways. I don’t feel pressured to clean any of the other days of the week. So during the week I do only the most basic things. We keep clutter picked up, I sweep every day, do the dishes and vacuum our main living room only a few other times depending on how busy we are. But other than that, I don’t do anything else. I am freed up to teach my kids, make meals and just relax because I know Friday is coming. If the kitchen floor is super sticky on Thursday, I know it will get cleaned the next day and I let it go. Sometimes waiting until Friday is hard, I have to force myself to leave it alone and it is always worth it. Friday always comes and with it, a clean house! We enjoy a clean house all weekend. This might be my favorite part! My husband looks forward to coming home on Friday because he knows the house will be clean. He once told me he cares more about coming home to a clean house than a nice meal on the table. I was shocked! Because this is important to him I put a high priority on it, and it is valuable to me as well so we both win! On Saturday morning we wake up to a fun day of family time instead of a house full of chores to accomplish. And of course sometimes we get to the deeper organizing or outside projects on the weekend but then we get to start those projects right from the start of our day. My Littles know what to expect. My Littles know that on Friday morning we will wake up and right after breakfast dive into our cleaning tasks. Not only do they know what to expect on Friday morning but they also look forward to it! They have even confessed to Cleaning Day being their favorite day of the week. This shocked me for sure. Even they like getting our weekend off to a good start and enjoy the feeling of a picked up house. And we’ve been cleaning this way for 6 years so now they are just used to it! So how does this work with Homeschooling? Truthfully I did not think I would be able to carry this routine over into our homeschool years but I was absolutely wrong. Each school day we just do a little extra school work, basically fitting 5 days worth of school work into 4 days. And remember, because I am not scattered trying to fit random cleaning assignments in every single day, this works out quite well. On school days we are fully immersed in school. On cleaning day we are fully immersed in cleaning. Over the weekend we are fully immersed in family time, relaxation and fun. I am so glad God brought me those lovely Mom friends way back when because this is the just some of the best bit of wisdom I gleaned from them. So each Friday morning you will find me and my littles scrubbing the grit of a week of living fully in our home, yet by Friday afternoon you will find me chilling out waiting for my husband to get home. The direct opposite of how I would feel trying to do a little each day, feeling like nothing was ever clean no matter how much I cleaned. So maybe give it a try? Because I bet they have some pretty good tips! Love this post! 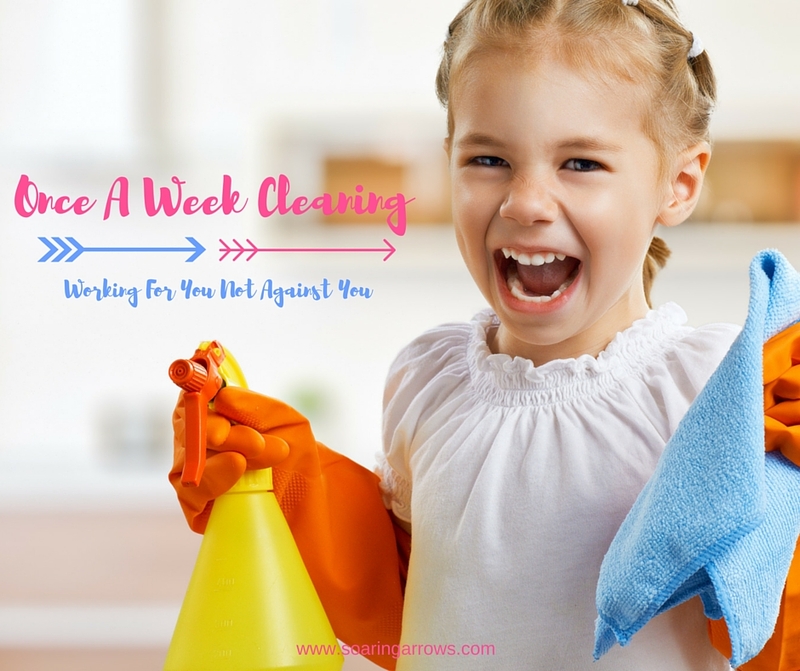 We used to do cleaning day on Friday, but we actually switched to Monday because the house is always a disaster after the weekend and we were late getting to school because of it anyway. I do miss that clean-for-the-weekend feeling … and honestly, my house has never ever been clean top to bottom (I guess it depends on what you include in that list) but I do like knowing that I have one day set aside for that and not stress about it on other days! I know exactly what you mean Lynna! Usually during the school year, we have to all pitch in about 30 minutes of picking up clutter to recover from the weekend which we do on Sunday night. During Summer I don’t mind doing that recovery on Monday morning. It is still all worth having the main dirt cleaned up and only having clutter to take care of! I think you are onto something Melissa! I love a clean home and often spend a lot of time cleaning and re-cleaning. Choosing just one day a week to do it ALL will save quite a lot of time and like you, the house would be clean for the weekend. A clean house makes this girl very happy… Thanks for sharing this! I think some additional changes are in order here. Angel yes that was not a good feeling for me! I hope you enjoy whatever changes you decide will work well for your family! I may make the switch back to once a day whole house. I’m attempting a “one room a day” idea. So ideally every 9 days my house is clean? I’m on day 6, and I think I need to redo a room already. * sigh always trying something new. 6 years of trying something new, one of these days I’ll figure out hot to be a stellar homemaker and lazy at the same time. There has to be a way!!! Right?!?! Lol to be awesome and lazy at the same time?!?! If only it were possible! I just love that. Amen to that Ana! I hope it works for you! Must be wonderful to have a clean house on Friday! With 4 kids I am good if the house is clean ever haha! Love your post!! I’m saving all of my heavy duty cleaning for this Friday! So far, it has been nice to not have to worry about those tasks during the day. Thanks for the great advice, Melissa! Jen I hope you like it when you try it out! It has been a lifesaver for me during the week knowing the cleaning is on it’s way! Otherwise I’d be cleaning All. The. Time! This is how we do it back home (Dominican Republic). But for us cleaning is usually done on Saturdays so I still do it that way! However, I hate cleaning on Saturdays. I rather relax and enjoy my family on the weekends. I recently cleaned the house on a Friday b/c I had family coming over the next day. Well, I loved it!! I had the whole weekend to relax (sort of b/c I was entertaining ) and enjoy my family! I think I might give Fridays a try again. Thanks!! Yes I am SO not a fan of cleaning on Saturdays, especially in the Summer when there are so many fun things to do as a family! The only exception I will make for Friday cleaning is for a day like today, my birthday, so instead we cleaned yesterday. I may love the feeling of a clean house on Friday but not enough to spend my birthday cleaning!